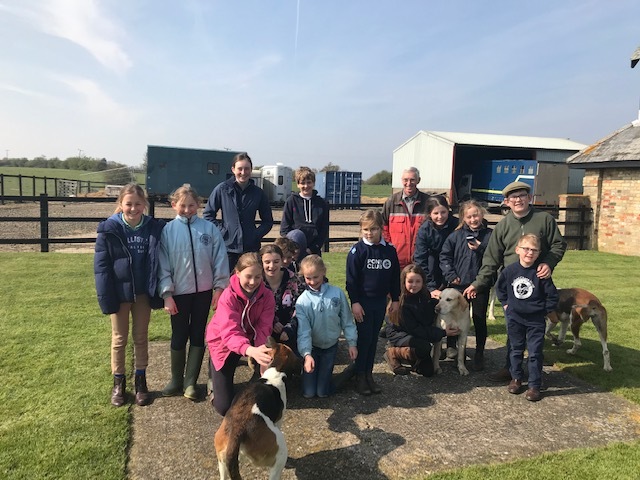 We had a very nice visit to the Kennels this Easter with lots of happy children enjoying running round with hounds and cuddling puppies, as well as learning about hunting and our Hunt. Congratulations to Henry, Kilda, Alexander, Sofia, Sophie, Lucy and Imogen for being awarded their Pony Club hunting badges and certificates. WINTER – the first instalment. It’s been a lovely warm autumn but once half term has gone the short days and long nights of winter bring extra challenges. EXERCISE : Difficult as it is to fit everything in, try to ride at weekends and if possible once during the week to keep a basic level of fitness in the horse. For riders, try and take part in what P.E. your school provides plus the routine winter tasks like mucking out your horse’s stable, a good way of keeping warm! TRAIN: for next year and to build on what you have done in the past months. For example if you have passed a test or competed at a certain level look at moving up. The branch organises training through the winter – just ask what is available. COMPETE: there are centres which run both dressage and show jumping through the winter and some do arena eventing, a fun way of keeping in practice. HUNTING: great fun for both horse and rider and will build confidence in your partnership. It really helps to get horses thinking forward. If you ride mainly in an arena go hacking as well to help prevent repetitive strain injuries – remember that ponies and horses have evolved to deal with different underfoot conditions. This is the time of year to look at your pony or horse with a critical eye to check his condition. It’s not always easy to be clear about your own horse’s weight – ask an instructor or your vet if you’re unsure. Condition scoring can be a help when assessing your horse. HAY:feeding good quality meadow hay is the basis of correct nutrition. The process of digesting forage produces internal heat which will keep your horse warm. Best fed at ground level and in the field as well as the stable, while horses are out during the day. FEED : when the horse is working, the weather becomes cold and wet or the horse loses condition. Use low to medium energy feeds – unless you have a race horse in training or are hunting hard twice a week! Fatties can be fed carrots and chaff if there is FOMO! Always cut the energy levels in feeds if you cannot turn out in the field increasing the forage part of the diet to help occupy him. Any horse that is stabled with no turn out will become fresh and buzzy and should have at least one hour out of the box, preferably in two periods. Most ponies and horses will grow a thick coat that is perfectly adequate. If in regular work, it is easier to manage mud and sweat by clipping and using rugs to replace this warm coat. Rugs should be appropriate to the individual, for example a cob type or native pony will not need the same weight rug as a Thoroughbred and often is uncomfortably hot. A low trace clip will be suitable for most ponies in light work – if you are hunting regularly a hunter clip may be necessary. Leave hair on the legs if the horse is in field all day but do trim the jawline. Up to Christmas, the coat regrows at quite a rate so time your clip for just before the holidays. After New Year, one clip will see you through to the Spring. Clipping out now means less hair to moult all over numnahs and coats. There are three Point To Points at Cottenham that I help run. December 3rd and 31st ,and February 10th. Always good racing. The horses all live out as I’m lucky to have large grass fields. The 2 foals who once weaned will come into a covered yard at night for ad lib hay and are fed stud nuts and alfa A twice a day. The brood mares will have hay but no hard feed as they aren’t due until mid/late June and they are both good doers. Eventer Tiger Mail has just had a month’s break and will start work next week with the aim of steady low key work, schooling and hacking to a reasonable level of fitness before increasing his work after Christmas. Weather permitting, he will go hunting a few times as well as indoor show jumping. Here’s looking forward to the Spring. A committee was formed in 2016 and venue agreed by kind permission of the Pemberton family. We are indebted to all the help that the Pemberton Family and the Trumpington Estate gave to the branch with the preparation and presentation of all areas of the estate used for the competition with the mowing and rebuilding the permanent cross country obstacles. We also contracted Legend Services for technical advice/build and the supply of new portable cross country fences. Our committee had two objectives, firstly to build a cross country course that all competitors at the grassroots level should be able to get round with “L” fences and secondly to try and improve the scoring/publishing of results and an earlier presentation time. 93 competitors on the day, 20 teams, and 13 individuals. One team made changes throughout the day which had major implications on the scoring. It appears that the Team Sheppard was sending team members in a different order and not in the order declared by the official Branch Representative. I don’t know who was to blame but this did cause confusion and time delays with scoring. Proposal: Absolutely demand that any team changes are made in writing at the beginning of the day and the onus is on the Branch making the change rather than the organising Branch. I would suggest that declarations are accepted only two weeks before the competition and a substitution/changes should be made only in the event of illness or lameness. We ran one area for teams and another for individuals. The first two teams were judged at the same time to ensure consistent marking with the President overseeing this stage and help to standardise the markings. The first few teams were judged very thoroughly and harshly and took far too long. Unfortunately despite the judges all having received a copy of the rules/marking system well in advance of the day, one judge insisted on the members removing a glove to check whether they had nail varnish on and marked them down if they did. We later checked the score sheets and reinstated the dropped marks. Tack and turnout score is determined by 3 judges giving up to 20 points per combination. To establish the Gosling Cup score, the total of the three scores is then divided by 3, this inevitably leads to a score such as 15.33333 or 14.33333. On the excel score sheet the results were rounded to show two decimal places but the computer still had the whole sum, the result of this was that some teams when on the final score sheet clearly didn’t add up which resulted in confusion and complaints. Proposal: Our proposal would be to have one judge who marks each combination of pony and rider out of 20. This would simplify the judging and speed the process up and result in true results on the scoreboard. We would also encourage the judge to make more positive comments and mark the positives rather than concentrate on the negatives. People spend an awful lot of time and effort into the T&T and this should be rewarded and remarked upon rather than concentrate on the flaws and omissions. I would also like to propose that the children are encouraged to do their own turnout and plaiting for instance rather than rely upon an army of mums and titivators who surround the mounted children whilst waiting to be judged, I do not feel this truly reflects the spirit of Gosling. We were happy with the dressage except for the fact that one experienced judge missed the scores for a number of movements and these were only discovered after the sheets had been collected and brought back to the scorers shed. We had planned to have the dressage sheets totalled in the vicinity of the dressage arenas but the dressage scorer requested that she be located with the rest of the scorers. The cross country course included the gate and also the slip rail as discussed at the previous meeting. In general we were happy with how the course rode and out of 93 starters there was only 8 eliminations. Timing was a key issue for our scorer and we think that this needs to be agreed and clarified in the rules for any future Gosling Cup competitions. Our scorer interpreted the rules (correctly?) and wrote his programme so that any cross country round in excess of the Time Allowed attracted Time Faults. This caused enormous confusion as there was no separate column for time penalties on the score board and the Time Allowed had not been clearly given. After a number of complaints from competing Branches and discussion amongst our committee the scorer wiped all the time penalties from the scores. As the Gosling Cup is at Grassroots level we believe that competitors should be encouraged to get around the course without having to worry about time penalties being imposed and we agreed that they would only receive penalties if they exceeded the ‘Time Limit’. 32 riders completed under the Time Allowed and those that exceeded it generally picked up faults elsewhere. The Time Limit (twice the time allowed) was never applicable because all riders completed the course within it. Proposal: We need to agree and clarify our interpretation of Time Allowed and Time Limit. Also agree and clarify whether time penalties should be awarded. Team Sheppard’s, parents etc. should also be made aware of the Gosling Cup Rules regarding Time Allowed and Time Limits. As a Branch we believe that we should not be awarding penalties for those exceeding the Time Allowed. We have no recollection of time penalties being awarded on the Hunter Trail phase in any previous year apart from the confusion that also occurred in 2016 at Stratford Hills. Time penalties go against the ethos of the competition. However the time allowed is required to calculate the Time Limit. As an aside: Explanation of how to calculate Time limit has been omitted from the Gosling Cup 2017 set of rules for the hunter trial but it states in the show jumping section that Time Limit = twice time allowed. Also to note – At PC70 and PC80 competitions an Optimum Time based on a speed of 435mpm will be used. No time penalties will be awarded for going too slowly. The Gosling Cup Rule book states that ‘TIME ALLOWED’ is calculated at 350m per minute, plus 15 seconds each for the gate and slip rail. An observation that was made was that despite the fence judges being briefed (by two experienced persons) to submit a diagram or note against any faults this was not done and would have helped enormously in the event of any queries being raised later in the day. All fences judges were also given a copy of the Pony Club Instruction Booklet for Fence Judges. The rules for show jumping also refer to TIME ALLOWED based on 325m per minute and they were judged on this, any member exceeding the Time Allowed picked up time faults and no one queried it. Surely Show Jumping and Cross Country should be standardised, either both disregarding any time penalties or both awarding when exceeding the Time Allowed not Time Limit. I think that if we are encouraging Grassroots level competitors they should be allowed to take as long as they need to complete the course. Proposal: Both show jumping and cross country should be consistent regarding the awarding or not awarding of time penalties. It would appear that at least one team representative of a competing branch entered the scorers shed and requested to see the entire set of XC score sheets for their member’s round. Unfortunately we were not aware of this until after the event and would strongly suggest that the scorer’s area is policed/stewarded at future Gosling Cups to prevent unauthorised persons from gaining entrance and disturbing the intense concentration on the job at hand. Double Clear Rosettes: The list was produced on the principle that competitors had to have 55 points from the hunter trial and 40 from the show jumping. This meant that anyone who picked up time penalties in Show Jumping was not on the list. Proposal: Should the collection of time penalties prevent the rider form being deemed to have gone clear? The scorer received comments supporting both sides of the argument. This time last year I assured all of those that attended the Gosling Cup Meeting that I had total confidence in our scorer as he had written the programme originally and had scored for a number of years for different branches. However he had deleted his original programme once he had passed the copy onto subsequent Branches. The copy he received from a former scorer did not work so he had to reconstruct a working programme basically from memory and the Rulebook. This took an enormous amount of time and together with the numerous changes that had to be made on the day (mainly due to the branch that swapped the team riding/arena order after the declarations had been made – delayed the scoring by about an hour) this meant that we were much slower in producing the scores that I had ever anticipated. Realistically with a field of nearly 100 competitors with the last phase not finishing until 5 pm or later, final scores with placings will not be posted until 6 pm or later, with 30 minutes added on for DC’s to check scores etc. This is without any unexpected delays due to course hold up etc. Gosling Cup is always going to be a long day without any problems/delays with the Tack & Turnout starting at 8.30 am. In hindsight which is marvellous thing, we would also have borrowed a better printer that could churn out Results Sheets quickly rather than having to hand write on the score sheets. Perhaps we should have disqualified the team for making unauthorised changes after the declarations had been made, but this would have been unfair on the children taking part. Our scorer was assisted by a lovely lady from Enfield Chace Pony Club who came along to see how the scoring worked, and has asked for a copy of the programme but we feel that it is currently unfit for purpose and certain issues need to be resolved, several of which had to be adjusted manually on the day so John is not of a mind to pass it on. Since it is two years before Enfield Chace need the programme it is hoped that there is ample time for a new programme to be designed. I should also say that our committee felt strongly that the whole scoring system of the Hunter Trails should be brought in line with PC eventing scores. A matter that needs to be discussed at the Gosling Cup wash-up meeting with the President and the other DC’s. Overall we really enjoyed hosting the Gosling Cup and we wish Essex Union Hunt a successful and enjoyable event in 2018. We achieved our main objective with the Cross Country Course and have a lasting legacy for the Branch for many years to come. We are also indebted to all those volunteers (just in excess of 100) that gave their time to help towards the running of the Gosling Cup, many behind the scenes, the grandmothers that made the packed lunches for the fence judges, the fathers that stewarded the parking areas, those that came and helped pack everything away etc. etc..
We were pleased that we raised so much sponsorship not only from parents but also from the local community and were able to invite them to attend on the day and enjoy our hospitality and enjoy the event in such beautiful surroundings. As a Branch we have had a very busy year running 36 rallies, 7 of which were Mini Rallies. We have run many trainings in eventing, show jumping, dressage, mounted games, polo, not to mention weekly badge training and unmounted test training. The Mini Rally program has really taken off this year under new management and has been incredibly well supported by our growing number of Under 12 riders. There is always lots of cake, biscuits, smiles and usually a picnic at the end! As ever, Camp was a huge highlight of the year at the beginning of the summer holidays. 70 members enjoyed the wonderful Trumpington estate, where they were able to ride in the extensive grounds and enjoy the incredible facilities laid out for them. Huge thanks to all those who helped from cooking lunches and suppers to helping with evening activities for the campers. It’s a massive team effort. And on to another team effort: At the end of the summer holidays, we were delighted to host the 71st Gosling Cup at Trumpington Hall. We built a brand new cross country course for the event and invested a huge amount of time and money making sure that the event ran perfectly from start to finish. All went brilliantly with the help of nearly 100 volunteers on the day! Enormous thanks should go to all of the volunteers but not least to the wonderful Pemberton Family. Without the Pemberton’s kind support the event would not have been possible. The Gosling Cup legacy will stay with us now, as the facilities at Trumpington are there for our enjoyment at rallies for years to come. Over the course of the summer we proudly sent teams out to represent our Branch at countless Area and Friendly competitions. In Dressage Katherine Ganczakowski qualified for the Grassroots Championships and performed really well at the finals. Anna Czylok won her arena at the Intermediate Dressage and went on to be placed 5th at The Pony Club National Championships at Cholmondley Castle. In show jumping, teams and individuals represented our Branch at the International Horse Trials at Houghton Hall in Norfolk in the Spring. Later in the year, two teams competed at the Pony Club Grassroots competition at Isleham. One of the teams qualified for the championships at Keysoe where they narrowly missed team placing. At the Pony Club Area Competition, Anna Braybrooke qualified to compete individually at The Novice Pony Club National Championships and just last month our Team at the Pony Club Team show jumping at Burghley Horse Trials came an agonising but brilliant 9th,. Our Novice eventing teams, comprising some 16 members, represented the Branch at the Area, Grassroots, Bloom Cup and Gosling Competitions. All competed to the best of their abilities with many personal bests. Lots of exciting prospects for next year. For those of you who don’t know, Iona Sclater was shortlisted for the British Pony European Team and achieved some truly fabulous results at Pony Trials on her pony Foxtown Cufflynx. Many of our other senior members campaigned their pony club ponies and horses at British Eventing and also achieved some great results this year. Tetrathlon has been ongoing throughout the year with our Branch posting some really great scores in shooting and Triathlon competitions and latterly Pentathlon. Our own treasurer, Sue Knott is our Area 8 rep and hopes to run a taster Triathon Rally for Area 8 next year – please look out for that one. We have had a couple of current and ex members racing, Benoit De La Sayette won the French Pony Racing Final in Chantilly, France in September. Noah BC is now working every weekend for Alan and Lawney Hill. He hopes to race at Cottenham and Horseheath this year. We need to watch out for both of these talented boys! Mounted games was in it’s infancy for 2017 and we are very pleased to have a new manager organising free games practices. We have not had fielded teams for inter branch friendlies as yet as most of our enthusiastic games players are very young and inexperienced but we hope to work on this over time. Anyone who represented the Branch at the Gransden Show Mounted Games Display might decide that it would be fun to participate more next year? Let us know if you are keen to make up a team – bigger ones are very welcome! Polo has been well represented by the CHPC, we had 7 members go to the Championships at Cowdray Park in West Sussex, a beautiful venue and great experience for them. Faris Ashraf has recently been selected to represent the UK at junior level. Well done and good luck to Faris. As you can see there is so much on offer for you. Whatever your level or age, please give a new discipline a try. You do not need to have the flashiest of horses to do well. Success comes from determination to succeed backed up by lots of hard work. Anything is possible if you want it badly enough. Looking to the future we plan to continue with plenty of rallies and trainings for you to attend, I hope that the numbers that attend the Monday evening Rallies will increase next year as they were slightly disappointing this year. I know that some of you have been dogged with lame or poorly horses and that has made attending pony club rallies and competitions really hard and frustrating for you. Let’s hope that next year will be a good, injury free year for us all. Anyone who is interested in representing the Branch at any Area competition really needs to be attending training throughout the winter and definitely throughout the spring and early summer so that you can really benefit from the experience of our brilliant instructors and facilities, prior to the Area competitions in July. And lastly we would like to ask that if anyone has any ideas or suggestions for training or new venues or any aspect of Branch matters, please email or phone either of us to discuss, we really need volunteers and ideas from the members to keep the Branch fresh and moving on in the right direction. Stay warm this winter and try to carry on with the trainings to consolidate the work you have achieved this summer. W look forward to seeing you all in the Spring raring to get going at rallies and competitions. Dengie Winter League Competition at College of West Anglia on Saturday 4th November. Three different test levels with the top four in each qualifying for the Area finals in the Spring. See www.cwa.ac.uk for more details. Do give it a go as it’s a great way of keeping your pony going over the winter and really consolidating the flatwork. It is a lovely low key environment for those that have never been before. Cambridgeshire fielded three teams at the Pony Club Polo Championships at Cowdray Park, the Loriner team won their division (the senior one this year). They played their final on what is probably one of the best grounds in the country in front of the castle. Our Rendell team came 2nd (admittedly out of 3, but it is still 2nd and the 4 girls played really well). The Surtees team came 3rd (out of 6) and did much better than last year. It was great to get 3 teams out in Cambridge colours. Ifanyone would like to have a go at Polo please contact Jane Frost or Julia Shaw. CHPC had a great day on Easter Monday with a good number of members competing and all representing CHPC so well. Lucy and Emily Shrimpton had a great clear round in the pairs and Jemima and Emma Shaw completed the course in style. In the Restricted, with a massive class of 60 riders, all our riders did a great job. Well done Emma Shaw, Lucy Clemoes, Anna Braybrooke, Neve Piper on her very new ride Gadget, Annalie Barker (5th) and Nelle Disley (3rd). Erin Braybrooke had a nice ride on Daisy in the Small Open and again on Maurus in the Open. Lucy Shrimpton took Charley around the challenging course and Jemima Pemberton on Ben went clear, as did Ella Chamberlain on Can Be Dun (2nd) celebrating her 16th Birthday! Congratulations to Anna Czylok, who came 2nd in the Pony Club Intermediate National Dengie Dressage Championships. A great result following lots of hard work. Well done Anna. Well done to our Senior Area Horse and Pony Care Team today – a very creditable 5th on a good score, against some very experienced senior competitors! Annalie Barker Neve Piper and Sarah Matcham Jenny Matcham – you were a credit to CHPC. ✨Thank you Jackie Piper for helping out at the competition and driving the girls there! Well Done to CHPC Members who took part in the Newmarket and Thurlow Pony Club Tetrathlon at the weekend – some great results; MINNOW BOYS TETRATHLON – 1st Alexander Macleod; MINI GIRLS TETRATHLON – 6th Sophia Macleod; MINIMUS BOYS TRIATHLON – 3rd Marc De La Sayette, 7th Louis Monmont, 8th Henry Pemberton. JUNIOR GIRLS TRIATHLON – 12th Rose Pemberton, JUNIOR GIRLS TETRATHLON – 1st Jemima Pemberton, JUNIOR BOYS TRIATHLON – 2nd Benoit De La Sayette, 6th Freddie De La Sayette. Really well done everyone!